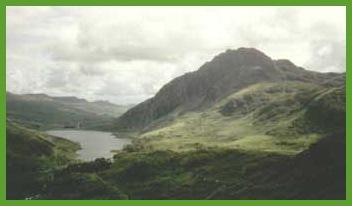 Tryfan. 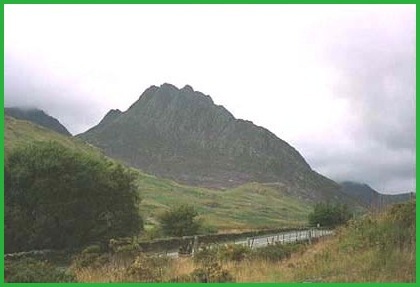 If I had to select a favourite mountain that I’d climbed it would have to be Tryfan. I suppose it really looks like a mountain. There is no long trek to get to the base of it or slow slog to get to the top. Within a mile or so of leaving Capel Curig going towards Bangor you see it on your left looking like the body of a enormous prehistoric reptile. A really beautiful and frightening sight if you know that for the next few hours you will be going upwards to reach the top of its "back". 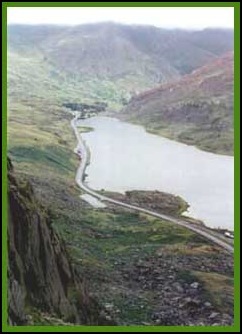 I first climbed Tryfan with Anne and our sons in 1990 when Greg and Ian were 15 and 10 respectively. We had intended to go up Heather Terrace, but missed the "turn", and soon were clambering up the North Ridge. 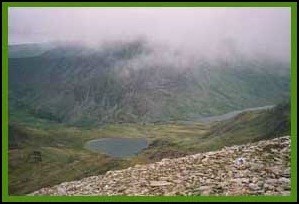 The view from the north ridge of Tryfan looking down on Llyn Ogwen. Y Garn is the mountain in the background.We were lucky enough to meet up with another climber who had climbed it before and was taking his daughter to the top. Having reached the top we came off via the col between Tryfan and the Glyders. However, rather than follow the path down to Ogwen Cottage we went for a quarter of a mile or so on the Miner’s Track towards Capel Curig before finding a low level path that went back to the A5 on the Heather Terrace side of the mountain. 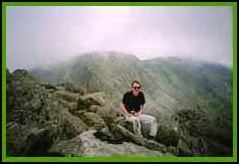 My second time on Tryfan was some years later when just Greg accompanied me. We went up virtually the same way but decided to extend the walk by going down to the aforementioned col, up the scree slope to the left of Bristly Ridge. From here it was across the Glyders leaving the mountains via the footpath that goes down near the Devil’s Kitchen and finishes with a pleasant walk along the side of Llyn Idwal. 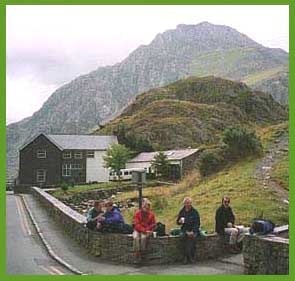 This has got to be one of the best walks in all of Wales and it was this walk that Mick, Larry, Peter and I decided to do in August 1999.
so it was an early start, but with not too much traffic, and Mick at the wheel, we were able to reach the "Little Chef" at Betwys-y-Coed soon after 9.30 a.m., about 2½hours after leaving Warwick. From here we were able to contact my son Greg, by mobile telephone. He was coming from Manchester with friend Mark who would be accompanying us this day. So after a drink etc. we continued and met Greg and Mark in a lay-by at the base of Tryfan about 45 minutes later. So it was on with boots, last check of rucsac contents and we were off. I have always been, like most people I suppose, a little anxious at the start of any climb. Today was no different, particularly as I was the oldest in the party and had not been on anything like Tryfan for some time. I started well enough but soon found the going hard work. I therefore conceded my place in the lead, but soon realised that the rest of the party were also breathing quite heavily too and, although it had been quite cool when we started, we were all soon taking off top layers as we trudged upwards. However, it was not long before the walking started to develop into more of a scramble. This I found easier as suddenly adrenaline took over. At times like this I don’t notice the energy being used. view. I must admit I feared the worst. Then he came back into sight. Some rocks had given way beneath his feet, but fortunately he had only fallen a foot or two although from above it looked very "mountain rescuish". Suddenly Larry and Peter who both looked a shade or two whiter joined him. My way had obviously been easier. After that the clamber up was less eventful and it was with great joy that we reached the top and Adam and Eve (the two rocks that mark the summit) for our lunch break. Larry was particularly happy to reach the top. 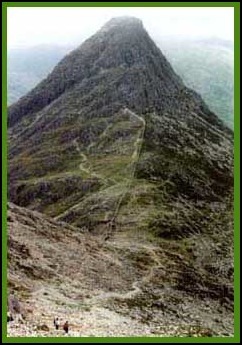 Although he has done some walking in the Black Mountains of South Wales he considered this to be a "real mountain". Although it is not that high, a little over 3000 feet, as stated earlier it really looks like a mountain and with all the scrambling we had done one feels a real sense of achievement. 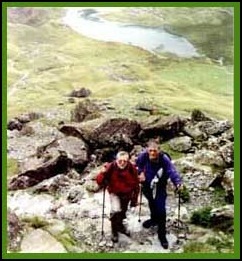 Mick also had not done Tryfan before but, with his son Simon, had accompanied Greg and me a few years earlier up Snowdon. Food inside us, we started down to the base of Bristley Ridge scrambling over rocks and feeling pleased that we were now going down when we met other groups toiling towards the top. A brief stop was had at the col before the scramble up the scree slope to the left of Bristley Ridge. me and was very happy to accept a cup of tea, or was it coffee, from him. Thanks again Mick. I really appreciated it. 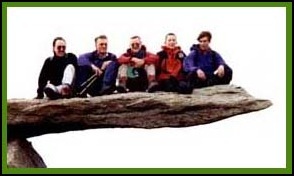 From here we carried on roughly westwards and within a short time reached Cantilever Rock. Thanks must go to Peter for what is, I think, the favourite picture of this walk, if not all our walks. Although the drop from the "Rock" is only a couple of metres or so, one is not aware of this when looking at the picture. 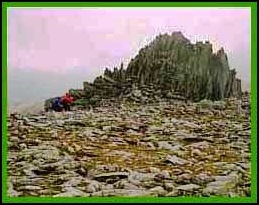 From here we continued to reach Glyder Fach, shortly followed by the spiky pinnacles of the "Castle of the Winds". I should have remembered that there is a considerable drop if you try to continue the trek towards Glyder Fawr by passing to the right of it. So, having initially gone the wrong way, we passed it on the left, "hit" the next part of the Glyders ridge and headed towards Glyder Fawr and suddenly were greeted by a downpour of rain. Although by now we had all got waterproof tops on as per usual, like the rest of the group, I was too slow getting to my over-trousers and by the time we had reached Glyder Fawr and the rain had stopped we were all walking in wet trousers. Fortunately modern walking trousers are usually very quick drying and it was not too long before we were all walking in dry legwear. Soon after we were carefully descending the scree slope that goes off the mountain to the col between the Glyders and Y Garn, and from here negotiated the rock staircase that passes under the Devils Kitchen on its way to Llyn Idwal. and we reached the bottom safely. From here it was a pleasant walk by the lake (Llyn Idwal) and below Idwal slabs, which were being well used by rock climbers. It was about here that the sun came out which made the walk to Ogwen Cottage very pleasant. From here it was back to the cars, walking on the footpath between the A5 and Llyn Ogwen, to end what had been a memorable and enjoyable climb on Tryfan and the Glyders. Needless to say we needed a celebration drink which Mick, Peter, Larry and I had at the Three Pigeons on the A5 north of Shrewsbury. I can’t remember the name of the brew, although Mick probably can, but it was a honey beer and it was perfection.